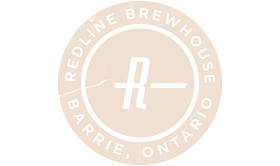 Want to take a behind the scene look at Redline Brewhouse? Learn the brewing process, and taste our beers? Redline Brewhouse uses high quality ingredients from North America, Europe, New Zealand and Australia. We’re also continually sourcing high quality, interesting ingredients from close to home and further afield. Our approach to brewing is rooted in the Belgian and American schools of thought. With a strong tie to tradition, and respect for classic techniques, we also like to push ourselves, and push the boundaries of brewing. As with any awesome creation, there’s an art and science to brewing. Well there’s no doubt we would happily nerd out endlessly on all details, such as the joy of malt and hops and the differences between bitter, sweet, light and dark beer….at the end of the day, our goal is to brew beer you love, and beer that leaves you with a unique and memorable experience. Having said that, if you’re into that kind of stuff ( like us) we’ve broken it all down for you below! 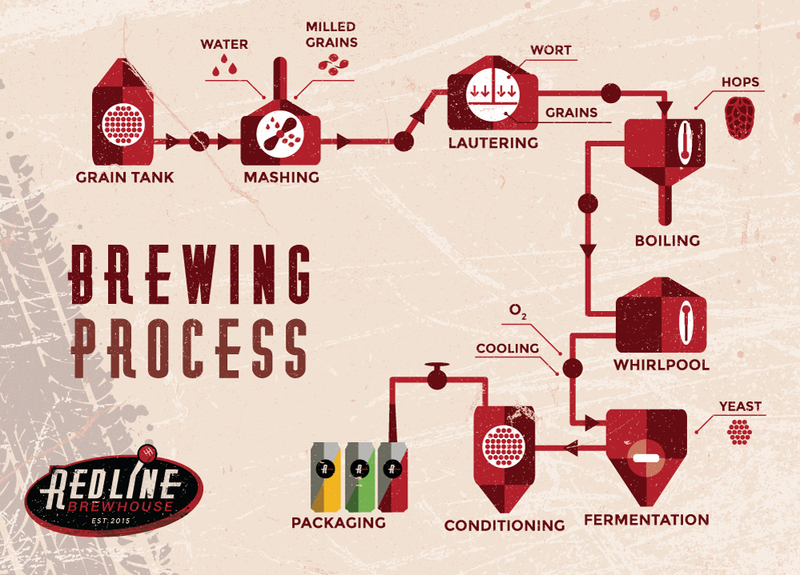 Brewing can be split up into 3 distinct steps, all of which have many processes. This is the hot side of brewing, where wort is created in the brewhouse. Milling – Malt is milled, where the grain is cracked to expose the starchy inside. Mashing – Hot water is mixed with the milled malt, and natural enzymes in the barley are activated that convert starch to sugar. Lautering – In a vessel with a false bottom, the wort (sugar water) is separated from the grain. Boiling – The wort is boiled, and hops are added. Hops will provide more bitterness when added early in the boil, and more flavour and aroma when added late. Other flavouring ingredients can also be added in the boil. Whirlpool – More flavour and aroma is apparent when hops (or other ingredients) are added in the whirlpool. There is also a separation of trub (leftover hops and protein) from our wort. Cool-in – Wort is sent through a plate heat exchanger, where cool water passes the other way, bringing the wort down to fermentation temperature and locking in flavour from the whirlpool. Yeast is added inline to the fermentor. We are now into the cool side of the process. Fermentation – Depending on the yeast strain, our ale fermentations take place between 18 and 23 degrees Celsius. Sugar is converted to alcohol and CO2, along with a myriad of flavours, yeast selection plays a big part of the finished beer profile. Dry-hopping – Some of our hop forward beers have extra hops added after fermentation. This provides a big aromatic nose, and fresh hop character. Conditioning – Beer is cooled to near 0 degrees Celsius where it begins to clear, flavours meld and stabilise and it starts to resemble what most people know as beer. Filtration – A select few of our beers will be filtered, and even then in a coarse manner. Because of this we may have a haze in some of our beers, this is not an issue, and will not damage the beer in any way. Carbonation – CO2 is added to the beer, most often in a controlled, force carbonated manner, though we will be going through the natural carbonation process when the style of beer works for it. We will be packaging our beer in kegs for draught both in house and at other bars, as well as for sale for home consumption. We’ve also chosen to start with cans as our means of distribution. We believe that cans are a great way to package and serve fresh beer, in a recyclable container. Check out our Beer ‘N Gear store for more information. These 4 ingredients make up the majority of our beer, but we’re not afraid to go off course to reach a new destination of flavours. Fruit, herbs, and spices may all make an appearance. Water – The most abundant ingredient in beer, our water is fresh and clean. Relatively soft, we are able to add various minerals to accentuate the flavour profile of individual beers. Malt – Malted barley provides colour, depth of flavour, body, and depending on the beer, some sweetness. It is the sugar source for fermentation, providing the basis for alcohol, and CO2 production. Sometimes we use malted or raw wheat, rye, oats, or other grains to provide interest and character to our beer. Hops – Added to provide a bitterness that balances malt character, hops are grown all around the world, and provide a dizzying array of flavours from herbal spice, to tropical fruit. We try to focus on hop flavour, rather than bitterness in our hop forward beers. Yeast – The least understood of all beer ingredients, yeast is a living organism that consumes sugar to produce alcohol, CO2, and an amazing amount of flavour. We have selected house yeast that provides us with versatility and great natural character for many of our beers. We are also working with a brand new yeast company from Guelph to create a unique yeast blend for our Belgian and Farmhouse style ales.